Spring is here so they say . . . I've been in hibernation for the last couple of months. Working with a software programmer as a musical partner in the band pianofield has its advantages. No sooner do I say things like "I sometimes wish that I could play two pianos at the same time and maybe a string quartet as well . . ." than he writes a programme that makes this possible. Amazing, Then I have to learn how to use it! So it's been real fun - developing my sound is what I love spending my time doing - a never-ending journey. 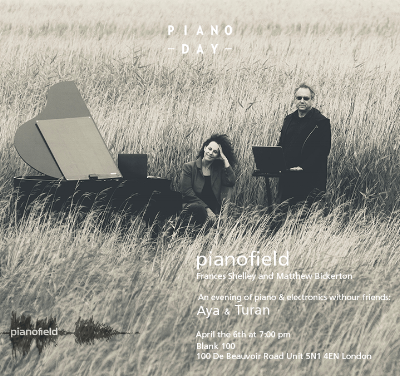 We will be trying out some of the new technology on April 6th for our event in Dalston in celebration of Pianoday. Tickets here. It will be a beautiful evening, and we will be joined by the gorgeous sister band AYA and fabulous singer Turan - come and relax your way into the weekend with us!